Here is NGC 2403, an outlying member of the M81 group. 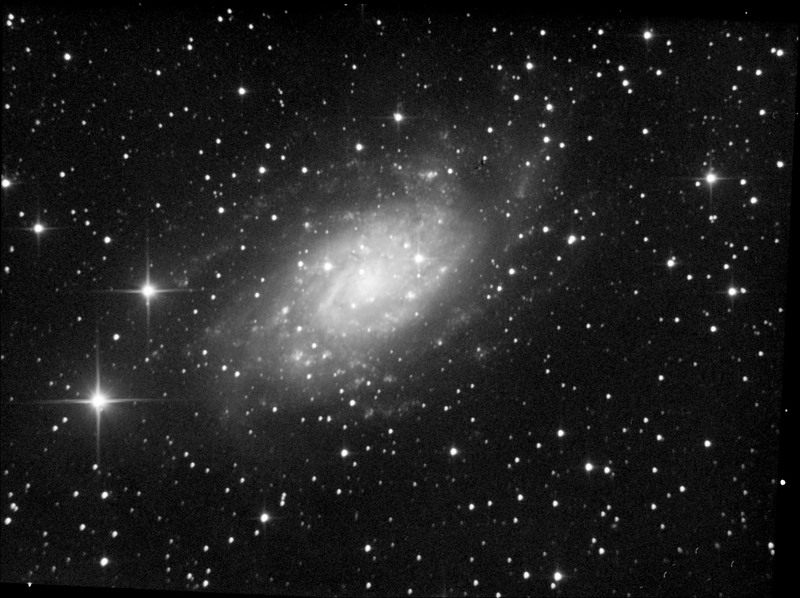 This galaxy has a suprisingly low surface brightness - the core is bright, but the dimmer regions spread beyond this image. This is a very serious attempt to try and gather a large amount of data on a particular object - three hours for the lum. I'm still struggling with the flattening of the colour - hence the aggressive blurring. Also a bit of distortion creeping in at the edges. I am still at the point where the colour seems to let down the luminosity. See the black and white version. As always with fast newtonians, focus and collimate are always an issue. I particulary like the bright knots of red/pink in among the hot blue stars - there is a lot of activity going on in this galaxy. I am suprised we don't see more colour images of it. Captured in Artemis Capture. Lums were at 1x1 binning, colour at 2x2. Stacked and calibrated in Maxim. Colour registered in IRIS. Colour combined and scaled in maxim. Photoshop used to construct multiple LLRGB image. Bit of selective blurring in maxim to tone down the rubbish in the background.